"Mars Ain't the kinda' place to raise a kid..." Elton John "Rocket Man"
After about a year of trying to figure out how to get my CGE Pro Mount to be detected by PHD2 (auto-guiding software), tonight I cracked the Code and was--for the first time ever-- able to get a green connection confirmatkon that PHD2 was detecting both my Celestron Mount and my Orion Starshoot Auto-guide camera and both using ASCOM drivers. Keep in mind, I'm doing all this on a MAC and much of my Astro software and drivers are written for Windows. Here's a screenshot to saver history. At long last. 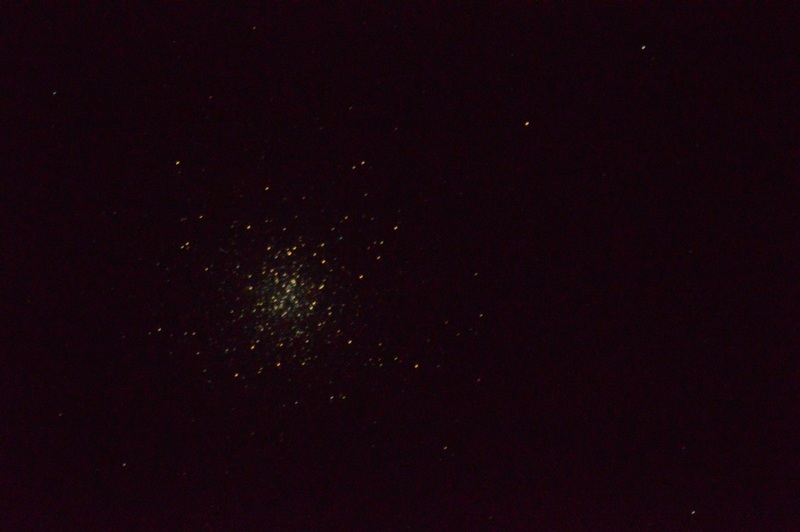 Next, I need to attempt to autoguide when the sky is not overcast. Once I figured out which cable to connect where and which adapter to connect where for this PHD2 thingy, I shot a Video so I can remember it. Eventually, I plan on uploading a series of helpful Celstron Edge HD 14 How-To Videos. hi guys, matt here. 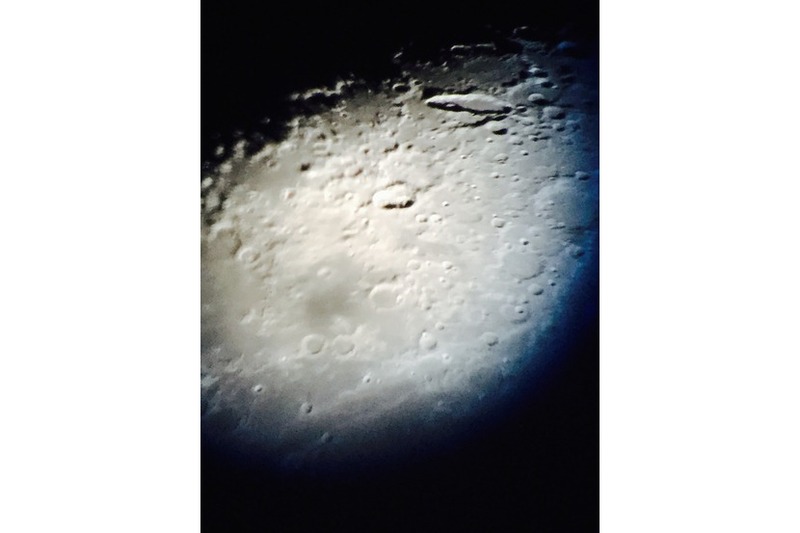 i shot the attached lunar photo at 9:55 p.m. from St. Augustine, FL on August 30, 2017 by attaching a Sony A6300 mirrorless camera to a 14-inch diameter Celestron Edge HD 1400 OTA telescope on a CGE Pro mount. 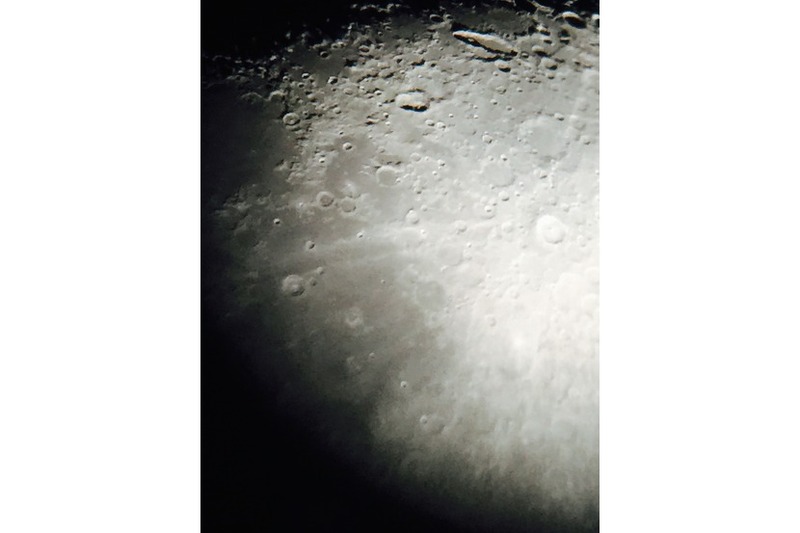 In essence, the telescope is the camera’s telephoto lens. ISO 640; Shutter speed 1/60 sec. 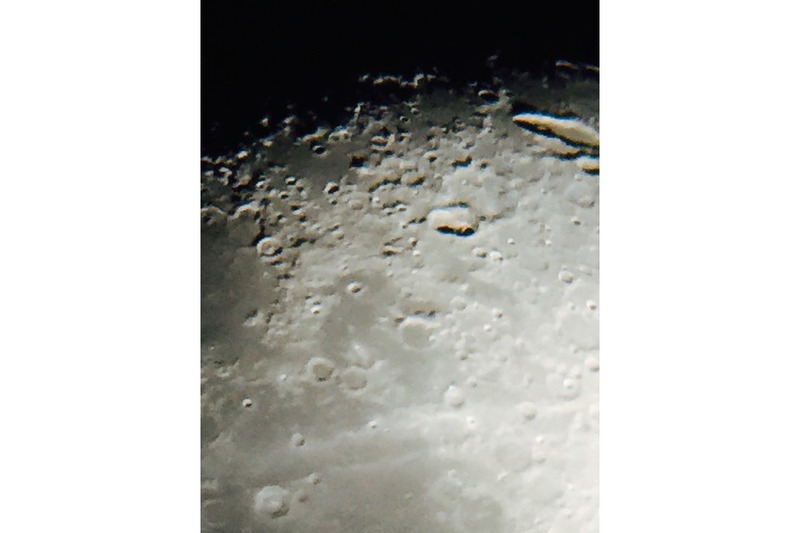 On this shot, you can zoom in and make out the faint, tiny Hadley Rille winding almost like a river along the tiny Hadley crater (north of about the top 1/5th of the Moon's Apennine Mountain Range, running east-west with shadows). The north-west curve of that Rille is where the Apollo 15 Mission landing was. 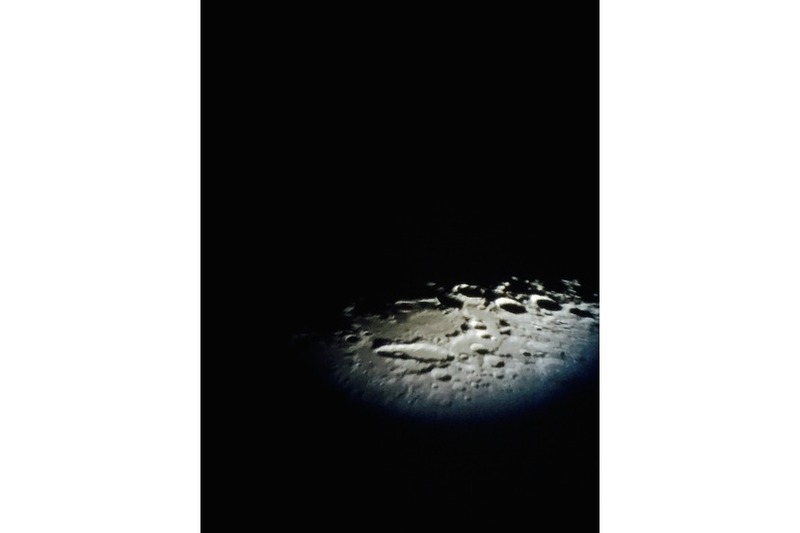 In the attached photo, you can also see the approximate location of the Apollo 11 landing site in the Sea of Tranquility—just northwest of the bird’s eye in the bottom left of the attached photo. The deep crater (with a triangular mound in the crater's center) at the left of the mtn range is named after Eratosthenes, Greek Astronomer living in Alexandria, Egypt, who in 200 BC, calculated the Earth's circumference using a stick, the sun's Noon shadow on the Summer Solstice, and Geometry, having never left Egypt. 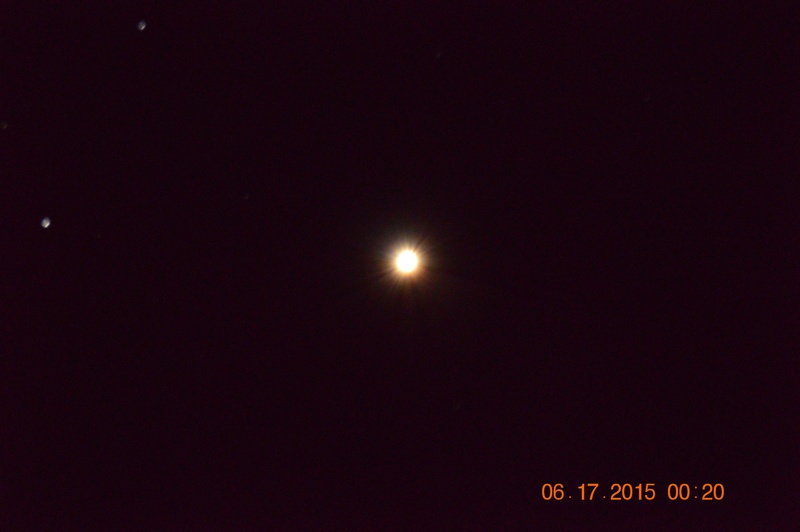 Saturn (single shot taken through Celestron Edge HD 1400 OTA on a CGE Pro mount, with a Nikon D3200, ISO 100, .5 seconds, July 3, 2015, 10:17 p.m., St. Augustine, Florida). 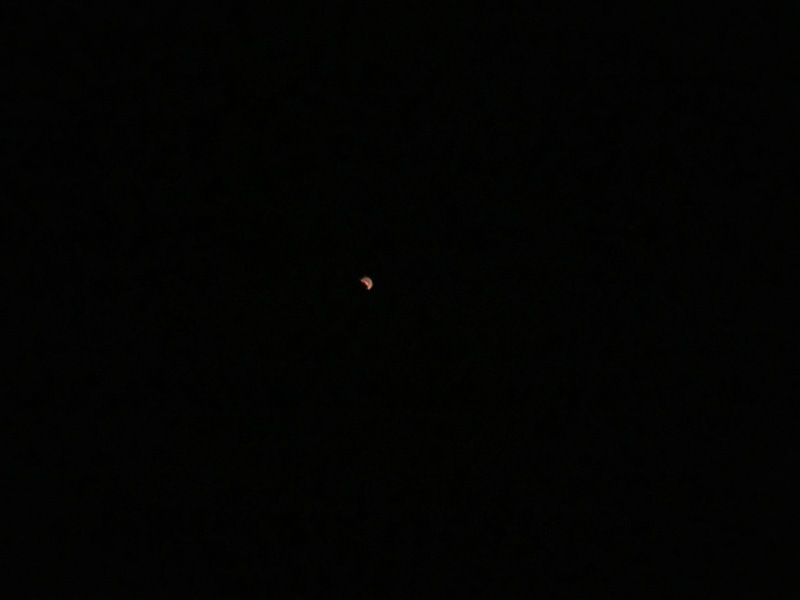 Saturn is about 800 million miles away from my scope and camera. Orion Nebula taken by Mercer Feb. 5, 2016, 4 shots taken 11:54 p.m. through 12:01 a.m. using Celestron Edge HD 1400 OTA telescope on a CGE Pro mount, with attached Nikon D3200 camera, exposure time ranging from 6.6 to 21.3 seconds. The Orion Nebula (also known as Messier 42, M42, or NGC 1976) is a diffuse nebula situated in the Milky Way, being south of Orion's Belt in the constellation of Orion. It is one of the brightest nebulae. M42 is located at a distance of 1,344 light years and is the closest region of massive star formation to Earth. The M42 nebula is estimated to be 24 light years across. Jupiter (taken through Celestron Edge HD 1400 OTA on a CGE Pro mount, with Orion StarShoot 5MP Solar System Color Imager, March 11, 2016, 11:34 p.m., St. Augustine, Florida). Jupiter is about 430 million miles away from my scope. Filmed in 4K format, 24 frames per second, 100MP, 35mm on Sony A6300 from my driveway. Hi, friends! Matt here. 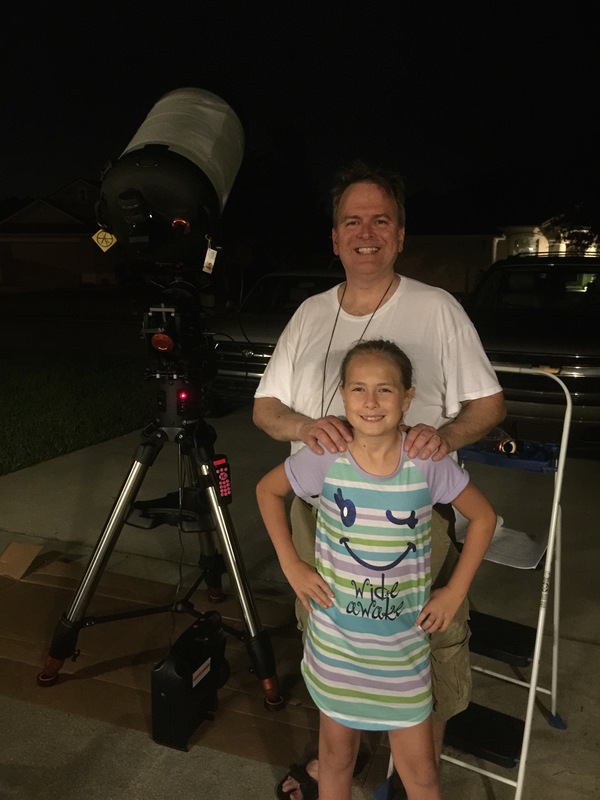 Welcome to my website (launched May 14, 2015) to share my journey into the study of planets, stars, globular clusters, nebulae, and galaxies! The site is powered by an Apple Mac and will continue to develop as I get more content. After scrolling down, scroll up top to see this site's different pages and content. Altair taken August 21, 2016 (with Sony A6300). 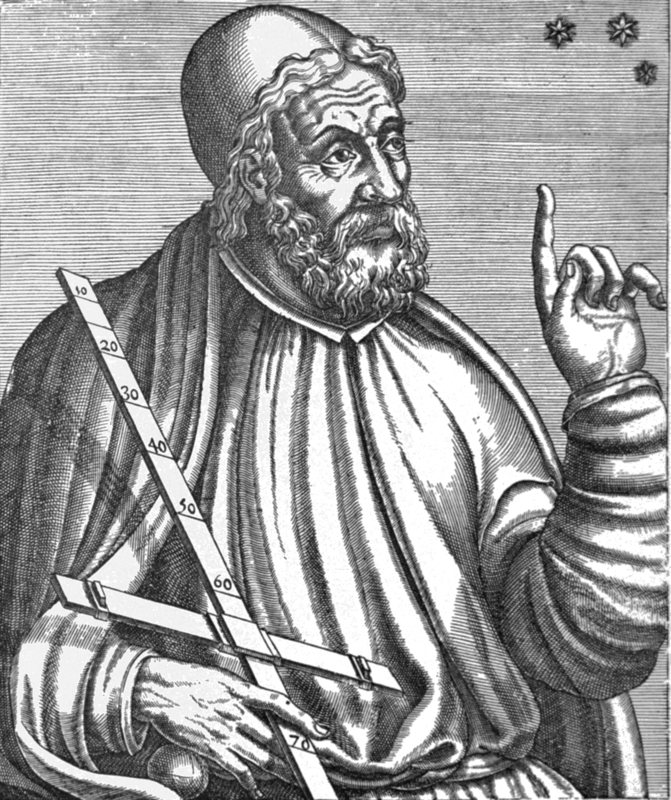 Altair is the brightest star in the constellation Aquila and the twelfth brightest star in the night sky. Shots of the Moon taken August 13, 2016 from my driveway. Orion Nebula taken Feb. 5, 2016 at 11:54 p.m. by Mercer with single shot (DSC0028) taken through Celestron Edge HD 1400 OTA telescope on a CGE Pro mount, with attached Nikon D3200 camera, 9.6 seconds exposure time. Learning that for the best astrophotos, i need an auto guider to eliminate minor tracking errors that occur during prolonged camera shots. I have one arriving on the 18th. 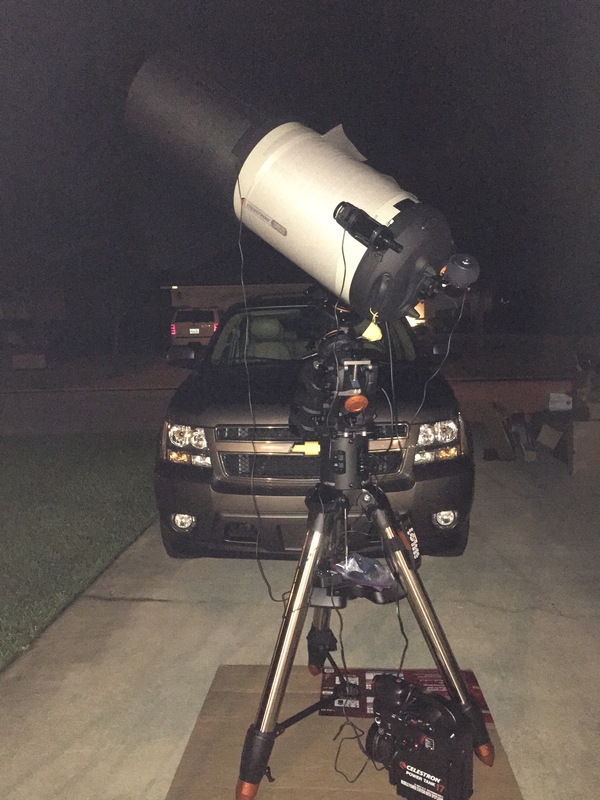 Last night, I installed my JMI Wheely Bar which carries the scope out to the driveway. Very well made and worked great last night. 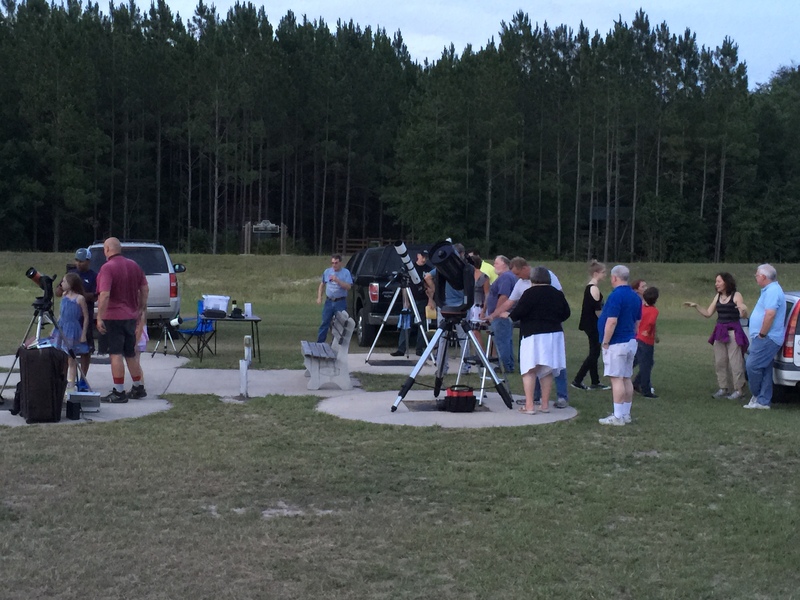 Last night's Star Party was a big success with great attendance. Ed, Tas, Lisa, Robert & I stayed until at least 1:30 a.m., at which point I departed. 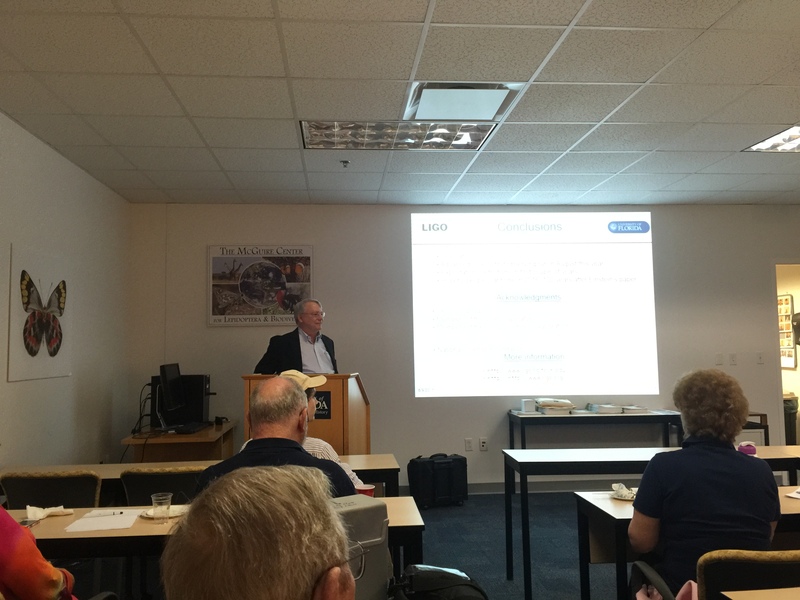 Professor Tanner presenting June 9 before the Alachua Astronomy Club on the topic of LIGO, Advanced LIGO and (suspected) gravitational waves. 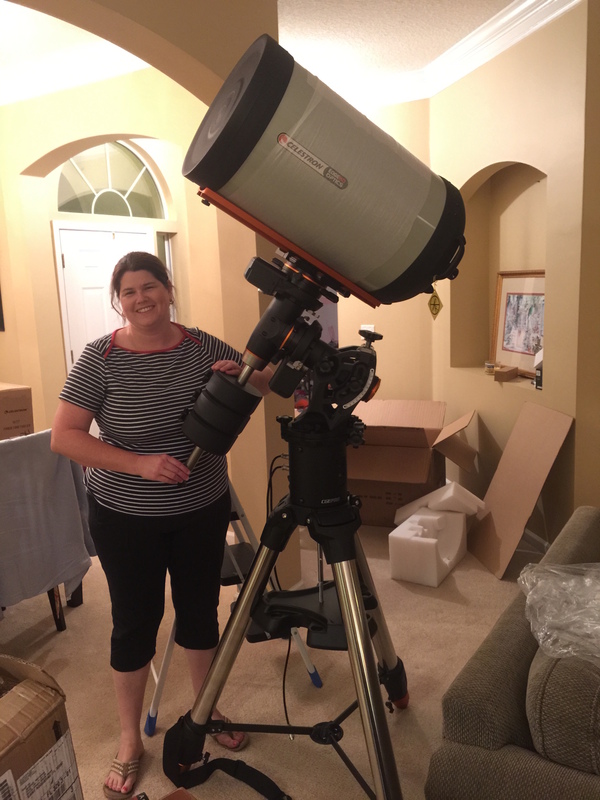 June 8: My scope set-up with my new checklist was easy (tonight was 3rd setup) and I figured out how to do a 2-star alignment that night. Still need to do a polar align. Stoked that my Green Laser pointer pen arrived today. Ordered it May 15th on-line. Only $7 & free shipping from Hong Kong! How do they make any money on that? 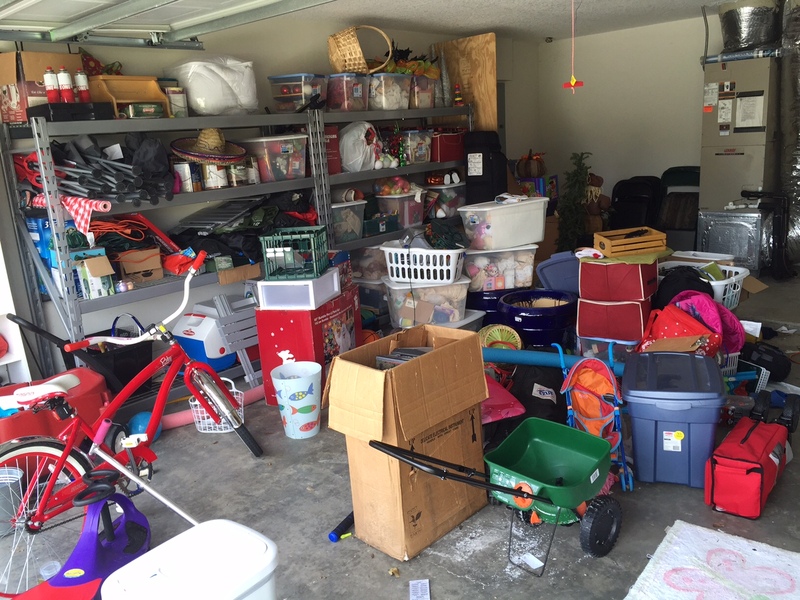 Saturday, I totally cleaned out the garage to make room for an "astronomy area" and (after the After Photo) pressure-washed the floor and inside garage door. All-day event, but well worth it. Anyone used the Canon EOS 60Da (DSLR camera) for Astrophotography? Recommend? 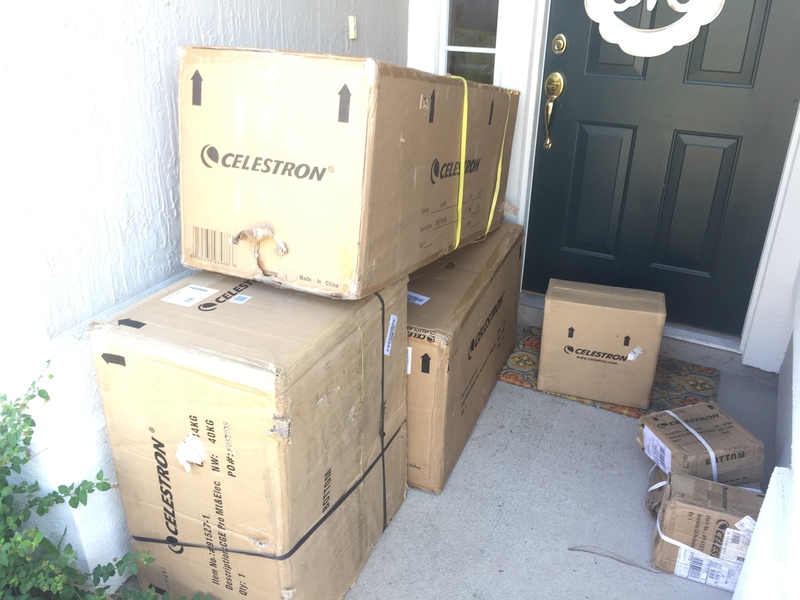 I ordered a telescope that ships today from Celestron in CA; it should arrive June 4th. 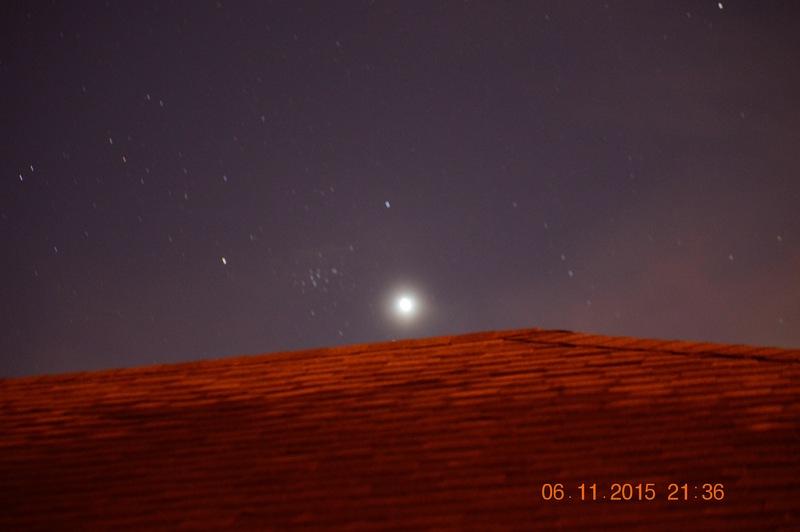 Excited to get a look at (and photo of) Antares, before the clouds rolled in tonight. Amazing day at Kennedy Space Center in Florida! Highly recommend it. Even better than it use to be. Spotted Leo and Regulus tonight just left of Jupiter! Scorpius was looking particularly bright, last night. Scroll to top to see this site's other pages.